Up Close! : Coffee and Cookies! 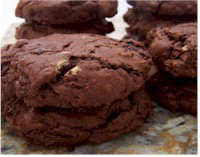 One of my wildest dream ever…is to bake a chocolate fudge cookies. A friend of mine told me that she saw some tips on how to make cookies and all I have to do is search it in the internet. So… I indeed follow my friend advice. All I can say is…”ohhh mmmyyy!” there’s lots and I want to do it all. And what made me almost passed out was… there’s coffee in the cookies. You might wonder why I am so frantic about having coffee in the cookies is because I love coffee a lot. This is just so perfect for me. And I can share this cookies with my friends who love coffee too. Coffee lovers like ate rocks, j-mie and pen. This cookie is a chocolate lover's delight. Not only are they made with a whole pound of chocolate, but they also contain both white and dark chocolate chips with a bit of espresso powder. You will recognize them by their distinctive shiny cracked surface which reveals a dark, soft textured interior. It is important to use a high quality, semi sweet or bittersweet chocolate that you enjoy eating out-of-hand because the flavor of the chocolate takes center stage. You will notice that this cookie batter is not like most where we cream the butter and sugar and then beat in the eggs and flour. Instead, the batter is made by whipping air into the sugar and eggs (similar to a sponge cake batter). Melted butter and chocolate, along with just a little flour, are then folded in. The batter does need to be chilled so it is firm enough to form into cookies. You could make the batter a day ahead if you like. The important thing with these cookies is not to over bake them or they will be dry. They are done when the surface of the cookies have cracked but they are still shiny. You may want to bake one or two testers to get an accurate baking time. These cookies are best the day they are made but they can be stored in an airtight container for a day or two. Since this recipe does make 24 large cookies, you may want to half the recipe.